too much today - join us and come back! This year there was little time to prepare, but one thing was outstanding for me. We tested how internet connections were while traveling. Jerome as "Nomad of the Air" flying back from Dubai to Washingon, and me as migrated "Nomad of the Track" (Flug und Zug). And it worked surprisingly well. Check the screens with video or just audio connections below ! and maybe get some insights on virtual conferencing [link] and what would be the ideal solution for future Future Days. Definitely we need experienced moderator who sit with all the control panels to "steer" participats and agendas, can mute and and ... In Conversation experiments we recently tested the ZOOM sysgtem which allows easy video-conferencing. We did Talking Communities for years. So check the link on Virtual Conferencing timeline above! Check the website and come back! and this is the UN Radio "teaser": Gaming experts are joining representatives from government and the private sector as well as policy makers, activists and students for what's being billed as the world's first "playable" policy conference. The Global Festival of Ideas for Sustainable Development, taking place in Bonn, Germany, seeks to provoke new thinking for a better world. Some 1,000 participants will be using a mobile app to collaborate on policies to achieve the Sustainable Development Goals (SDGs) in a hypothetical country. Note: it is "with" not "for" Africa ! IIASA [link] will host the ECSA General Assembly. ECSA is a non-profit association set up to stimulate the growth of the Citizen Science movement in Europe. It draws from 200 individual and organizational members from over 28 countries across the European Union and beyond. On January 25th, 2017, IIASA will host the ECSA General Assembly. ECSA is a non-profit association set up to stimulate the growth of the Citizen Science movement in Europe. It draws from 200 individual and organizational members from over 28 countries across the European Union and beyond. Key to Feeding the World” in Berlin from 19 – 21 January 2017. In the afternoon we convene in the Telekom with an International Business Panel: Water, Food and Agriculture translated into 8 languages, as we have high level participants also for the G20 gathering tomorrow again in the Foreign Office. BIG or HIDDEN AGENDA !? What should be done !?? Trump Book Warns of Obama’s ‘Government in Exile’ A book is hitting the street today, 30 Minutes ago and so premature ?! I find this the most vicious blow [link] I came across since long. A president in office having a "Government in Exile"? I only once really got involved into demonstration - when we did in Berlin the Monday Demonstrations for weeks against the War in Irak. I always felt I stick to by other sectors, or segment, where I hope I am better at. See Diagram by Cop MacDonald: TOWARDS WISDOM [link] and WHAT REALLY MATTERS: [link] But here Ignorance is not Bliss, it is mean and intentional! and self-serving at the same time. I feel we have to dig here deeper ! as it is a sign of our "Our WORLDVIEW is too Flat" [link] as we presented in 1993 with the Futurists of the World" Demagoges and media can manoeuvre public opinion ! I am totally agitated - This is not the America I traveled 45 years ago and visited some times. I SAY NO ! so Today is the official opening and this beside the public access and the facades [link] are a great symbol for this really breakthrough, hazardous exercise of elitist try to include the common people. Me ! I heard stories for years in the 70ies and 80ies from ALFRED SCHINZ [link] on the methods, learning, failings and breakthroughs in building the Philpharmie in Berlin. 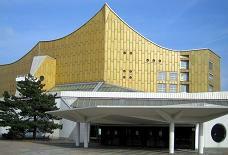 Alfred was the right hand of Scharoun and mentioning Hugo Häring https://de.wikipedia.org/wiki/Hugo_H%C3%A4ring like every week. We hope to celebrate Alfred Schinz' 100th a the Technical University in Berlin in 2019.